Mirrodin Besieged is the second set in the Scars of Mirrodin block. The set features 155 black-bordered cards, including randomly inserted premium versions of all cards in the set. It will be available in intro packs, booster packs, and fat packs. The set introduces new mechanics including battle cry and living weapon. A new Planeswalker card is included. Mirrodin Besieged continues the story of Scars of Mirrodin as the Phyrexian Invasion lays waste to the Mirran countryside and its people. The set itself is split strongly between the two camps. For example, the prerelease and release parties featured a special type of booster that contained only cards from one faction or the other, requiring the players to choose between them for their deck-building. Intro packs were also separated between the factions. The expansion made a change to the draft format. 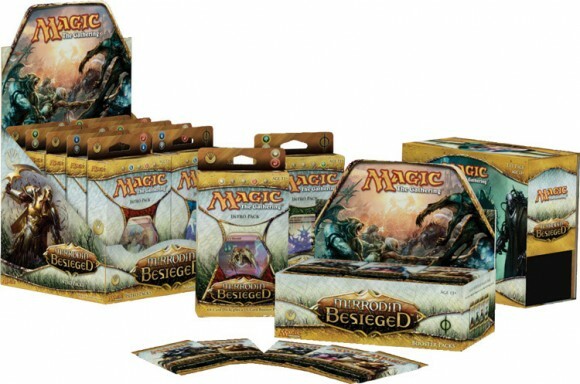 In all previous draft formats the group of players started with the first set in a block, but starting with Mirrodin Besieged, the first pack to be opened is of the most recently released set. The number of packs does not change however, so the the draft format for Mirrodin Besieged was one booster of Mirrodin Besieged followed by two packs of Scars of Mirrodin. Two new keyword mechanics are featured, one for each faction. The Mirran keyword is Battle Cry, which gives every other creature that attacks when the creature with Battle Cry attacks a +1/+0 bonus. The Phyrexian mechanic is Living Weapon, a new keyword for Equipment. All equipment with Living Weapon give a power/toughness bonus, but upon entering play they put a 0/0 black Germ creature token into play and attaches the equipment to it. A new rules term is “poisoned”. A player is poisoned if they have any poison counters. The mechanics Metalcraft, Imprint, Proliferate and Infect also return. 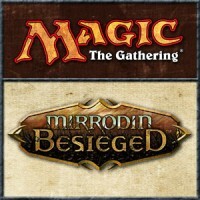 Add a Review for "Magic: The Gathering – Mirrodin Besieged"